Intrusion Detection | Fancom Connects Ltd.
Intrusion detection along with Access Control and Video Surveillance are considered to be the three main elements of an electronic security system. As the term suggests, intrusion detection most commonly refers to the detection of unwanted persons or objects within a defined space or perimeter. A variety of methods can be deployed to enable security personnel to detect when a security boundary has been breached. 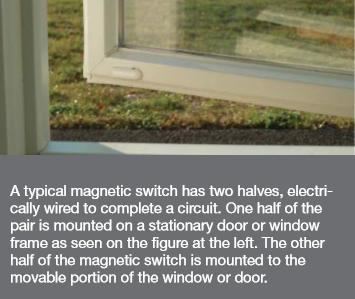 A common choice for a detection system for doors or windows is the use of a magnetic connection. While these magnetic switches come in a variety of styles, both door and window locks operate on the same principle. When the two halves are close together, the circuit is closed indicating the window or door is secure. If the window frame is opened, the two halves slide apart, the electrical circuit opens and a monitoring device would indicate an open state. For windows, this type of intrusion detection can also be used with a “glass-break” detection system, as the window could be broken to allow access while the magnetic switch itself remained in a closed position. Another less obvious method to detect that a security border has been breached is with the use of infra-red technology. Beams of invisible infra-red radiation are used in a similar fashion to the magnetic lock application as a means of completing an electrical circuit. When the circuit is closed the system would indicate that the area guarded by the infra-red detection system is secure. If the beam is breached by the intrusion of an unauthorized person, the circuit will be broken and an appropriate alarm would be sent to alert security personnel to the fact that an un-authorized person has entered a secure area. The alert could be silent or set off a series of audible alarms or visible security strobes. A more sophisticated intrusion detection system uses laser beam technology. While this technology looks impressive, the basic principles of open and closed circuits apply. These technologies can be visually impressive lending a certain amount of visual intimidation factor to thwart would-be intruders. Light beams on these systems can be static or they can be made to move continuously, adding a heightened level of security to any situation.